See incredible West End shows this March with the TodayTix Spring Ticket Event – get tickets for £15, £25 or £35! Having seen Beginning two nights before meeting the show’s leading lady, Justine Mitchell, I was buzzing with questions for her. 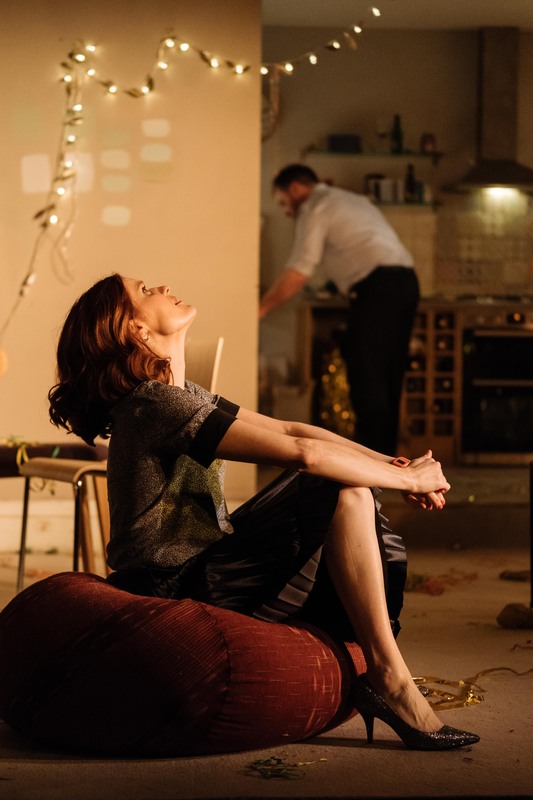 The show is a smart, hilarious and deeply emotional piece of theatre, written by David Eldridge and directed by Polly Findlay. 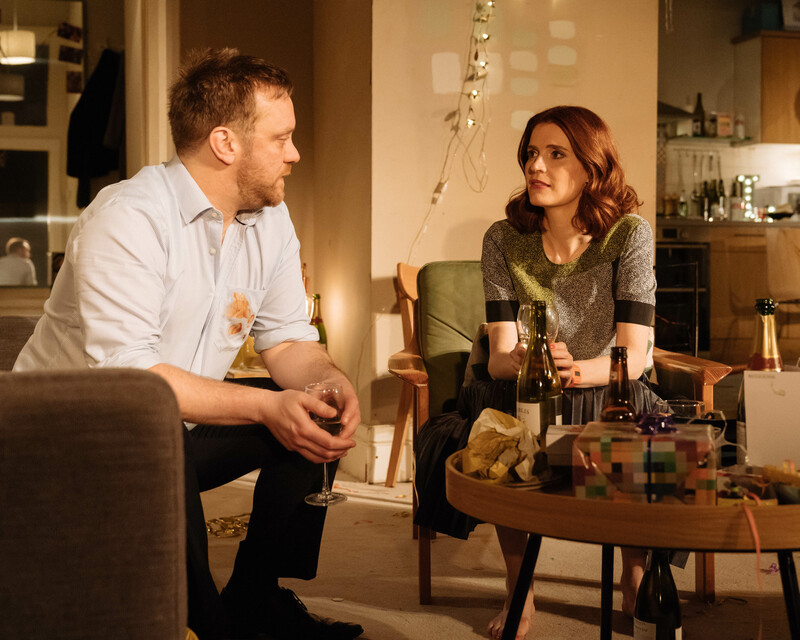 It starts at the end of a housewarming party at Laura’s (Justine Mitchell) but Danny (Sam Troughton) is still there. As the two begin awkwardly navigating their attraction for each other, truths are revealed and a surprising opportunity presents itself. It brings up questions of love at first sight, issues of fertility, feminism and the negative effects of masculinity – it’s simple and complex all at once, as well laugh-out-loud hilarious. I met Justine at the Ambassadors Theatre and settled into her dressing room to chat. Her performance of Laura, while emotionally vulnerable, is hilarious, and it was delightful to see she’s as funny off-stage and she is on. As we chat, she describes her early experiences with acting revolved around getting a laugh, and the feeling of being funny. We talk about her education and going through drama schools, then getting her first job at the Almeida. She pauses in her story briefly to make me laugh with a sketch she once performed, playing a forgetful TV host, as she struggles to remember names of other actors she’s worked with. As we talk for the best part of an hour, I see quickly that’s Justine in a nutshell – full of stories with a will to make whomever she’s talking to laugh, a helpful trait for working on Beginning. Beginning is a new play – how did the project come together. ‘With a new play, you get to mint it. That’s just unbelievably special. Whenever they do this play again, they’ll get the script and it will say, first done in the Dorfman, directed by Polly Findlay and played by me and Sam. And that’s the kind of stuff that, when I was in drama school, we’d look at our texts and see that. When I first got the script, I had to read it again and I just thought it was very sad. And then, when I got the second audition, and I first met Sam [Troughton], I said to him, ‘Oh it’s quite sad isn’t it?’ And he said, ‘Yeah…I think it’s quite funny.’ Then when he started reading it with me, it was so funny, and we had thought about it so differently. Plays aren’t meant to be read, they’re meant to be done! Do you find people relating to Beginning? Did you recognise Laura as a many might call her a ‘strong female character’? ‘I didn’t think about her in that way because I contacted her hurt first, and her melancholy and her frustration and her despair. I knew she was a Corbynite but she’d only joined in August of that year! She’s of her time. People like her who joined the Labour party in August of 2015, suddenly started to get involved. What is it like to play an audience, pulling them from deeply emotional scenes to hysterical laughter? ‘It’s joyous. And it’s so normal, life operates like that. That’s why they [Laura and Danny] get on, and they do get on, right from the top of the show. And that’s how people get on, isn’t it, with humour. Figuring out what another person finds funny, it’s a real shorthand to get to know someone super quickly. So, you’re reading a script and you see there are emotionally and physically vulnerable scenes you’ll have to have with someone you’ve never met before. How do you begin to build a bond of trust with the other actor? ‘It was a joy on this play, but it’s the anticipation that’s hard. But then when you’re doing it, it’s a relief. Sam is a superb human being, so it turned out to be so easy. I said to my husband this morning, ‘Imagine if it were someone else.’ I can’t even begin to imagine doing this show with someone else. We get on remarkably well and make each other laugh, and there’s just trust there. We take the same approach too, we like to see how alive we can be, trying to ignite stuff in each other. For those romantic scenes that play out between your characters, what’s your experience as an actor performing these intimate moments in front of an audience? Get your tickets to see Beginning, or checkout our Spring Ticket Event for March performances only! Want more? Behind The Curtain At The Grinning Man.